Ocarina Workshop® is a family business centered in Kettering, Northamptonshire, England. Founded in 1983 by David Liggins, and developed from 1989 onwards in partnership with his wife Christa, Ocarina Workshop has continued to grow, with the help of family and friends, and is today a thriving and respected music education company. David Liggins taught music in Leicester from 1976 to 1979, developing groundbreaking methods of whole class instrumental teaching with guitars, keyboards, tin whistles and singing. Christa Liggins taught languages in Kettering from 1985 to 1989. After their marriage, Christa joined David to work full-time with ocarinas in a rapidly growing business. 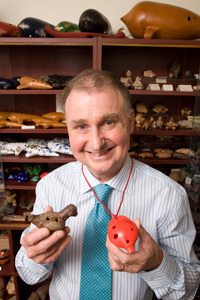 Between 1989 and 2009, they released a total of over thirty new publications and introduced innovative teaching methods for whole class music, all using ocarinas. A commitment to excellence has seen David and Christa researching the ocarina’s history in locations as remote as the Atacama Desert in Chile, performing on ocarinas with their children in Italy, Switzerland and Norway and introducing ocarinas worldwide through Ocarina Workshops and Festivals. Their children also played with Masquerade Ocarinas in the National Festival of Music for Youth 2005, winning an Outstanding Junior Performance Award. 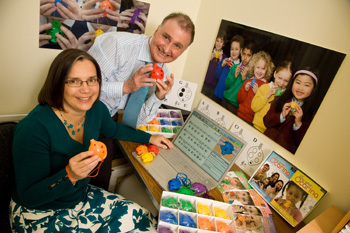 In 2005 David and Christa began production of their plastic rainbow ocarina, the Oc®. This uniquely simple instrument is now the key to musical success in schools worldwide. David and Christa are proud of the fact that all Ocarina Workshop publishing and manufacturing takes place in the UK, mainly within 50 miles of their Midlands home. This is environmentally friendly and guarantees quality of production as well as continuity of supply. David and Christa’s contribution to industry, education and music has been acknowledged in Parliament, and has been influential in the lives of thousands of young musicians. They continue to put the customer first and trust you will enjoy this website and the service you receive from Ocarina Workshop.